You won’t believe these Cool Duvet Cover Sets! I am a HUGE fan of cool duvet cover sets because they can bring life to a boring bedroom in seconds! All you have to do is find an old and beat up (or plain and boring) comforter and insert it into your new duvet cover for an instant bedroom makeover! I am always on the lookout for the latest duvet cover additions on the market and when I saw these ones I couldn’t believe them! They are so realistic, so vibrant, so colorful and so beautiful that they will take your breath away for a few seconds! There are so many out there that I had to create this page to show off my favorites! Unique Bearded Dragon Print Duvet Cover! This is what I mean folks! I bet you have NEVER ever seen a cute bearded dragon print duvet cover before, have you? The cute beardie is looking out a window. *Just get the matching beardie print pillowcases and you are all set! Great for any lizard lovers! Gigantic red roses up close duvet cover set! How is that for a couple’s bedroom or a very romantic lady? *Just get the matching gorgeous red roses pillowcases! I LOVE this Gorgeous Rainbow Roses Duvet Cover! Another stunning roses print duvet cover for sale! They are so romantic and so beautiful! I love these fun and colorful rainbow roses! Very pretty and cheerful! *To create your very own ‘rainbow roses’ bedding set, just get the matching rainbow roses print pillowcases. Then this is your perfect duvet cover! It has a cute picture of two doves in love by the ocean. *Just get the matching cute doves print pillowcases. Who wants to take a walk through a magical forest every time you enter your bedroom? With this amazing ‘magical forest trees’ design duvet cover, you will be! It is so cool and unique! Love to watch birds and the sunset? Then you are going to LOVE this gorgeous birds at sunset beach photo print duvet cover for sale! It feels like we are at the beach too! Can you hear the birds and the wave sounds? Just get the matching birds at sunset print pillowcases to create a gorgeous ‘sunset’ bedding for you! Now we are transported into a magical spring field full of white wildflowers! Perfect spring theme duvet cover to brighten up any bedroom! *You know what to do… get the matching white floral pillowcases! 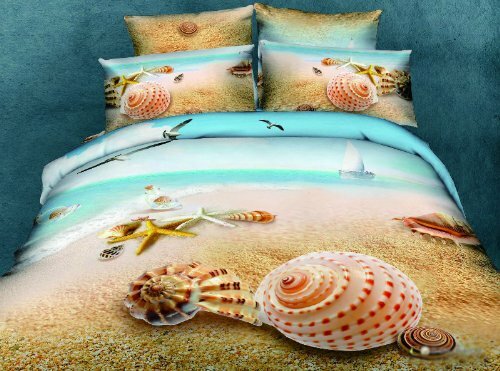 3D Beach Theme Bedding Set! Have you ever wanted to live on the beach? Another spectacular and stunning beach print duvet cover for sale! It shows a beautiful beach full of cool seashells on the sand and the waves crashing. It’s like you will be sleeping on the beach every night! *Yes, you can also get the matching seashells on the beach pillowcases. How about sleeping in a beautiful pink nature print duvet cover every night? With this amazing PINK TREE photo print design duvet cover! I have no words to describe how beautiful this is! Perfect fo a girly lady’s bedroom! Very feminine! *Get the matching pink nature pillowcases and enjoy your new bedroom! Look what I found now, fellow scuba diving lovers! A stunning and very unique fish swimming underwater photo print design duvet cover! How peaceful and serene is it? Will calm you down instantly! Will make your bedroom look like a beautiful ocean! *Just get the matching swimming fish pillowcases! Have you always wanted to have a beautiful floral duvet cover? Now you can have one in your bedroom! How stunning is this red periwinkle flowers photo print duvet cover? Can you imagine how amazing your bedroom is going to look? And I leave you here today sleeping on a bed of rocks every night! How amazing is this fun rocks photo print duvet cover? To create your very own ‘bed of rocks’, just get the matching rocks design pillowcases! Sweet, comfortable dreams! *I hope you enjoyed my selections of cool 3d duvet cover sets from this page and were able to pick the most amazing and impressive for your bedroom! Stunning 3D Sunflower Bedding Sets! Amazing 3D Galaxy Bedding Sets! Hi Laura, I am not a store. I only recommend bedding sets I like from virtual stores. Thank you for visiting!